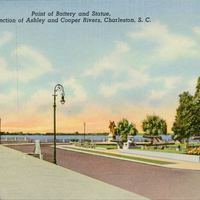 A postcard depicting The Battery at the junction of Ashley River and Cooper River in Charleston, South Carolina. The Battery is a defensive seawall and promenade named for a Civil War-era defense artillery battery located at the site. Originally created by the Charleston News Company and published by Curt Teich and Company. "Finally a fix for the Battery." The Post and Courier, December 26, 2012. http://www.postandcourier.com/article/20121226/PC1002/121229579/1021/finally-a-fix-for-the-battery. Charleston News Company. 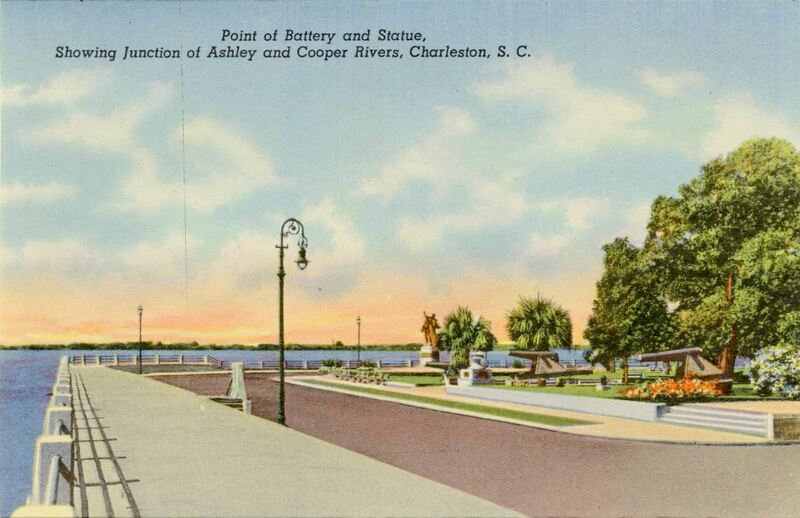 “Point of Battery and Statue, Showing Junction of Ashley and Cooper Rivers Postcard.” RICHES of Central Florida accessed April 24, 2019, https://richesmi.cah.ucf.edu/omeka/items/show/6701.